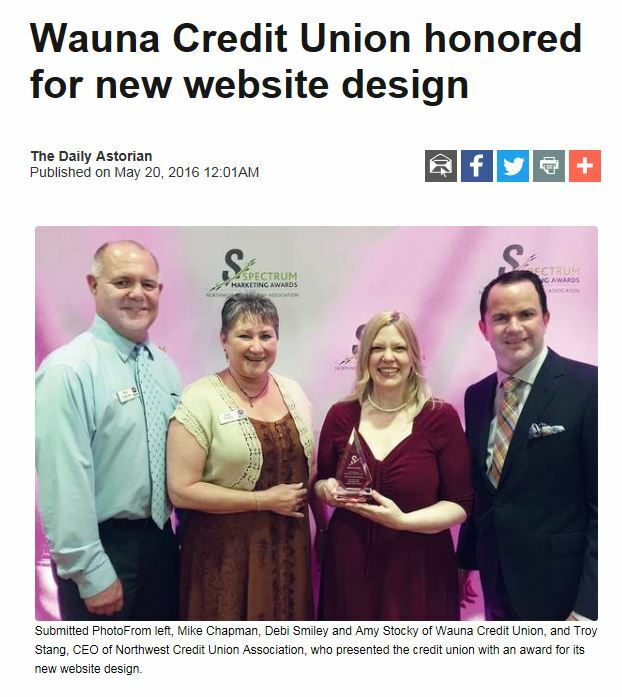 Wauna Credit Union was recently recognized by the Northwest Credit Union Association (NWCUA) for its website update, and received an honorable mention trophy for excellence in marketing and communications during an awards ceremony and dinner April 7 held at Hotel Monaco in Portland. The full website rebuild, which took the financial cooperative much of 2015 to create, was called bold, fresh, and modern by the judges. It features easy navigation and a responsive design, and is much more streamlined than the one it replaced. The development team consisted of COO Debi Smiley, Stephanie Sievers, Carli Lyon, Cameron Willets, Jacob Humphries, and was led by Wauna CU Marketing Coordinator Amy Stocky, with oversight from Marketing Vice President Mike Chapman. The group worked with the Portland web developer Avtec Media. The award was presented by NWCUA CEO Troy Stang at the gala event that honored more than 30 Northwest credit unions for their outstanding marketing achievements in 2015.